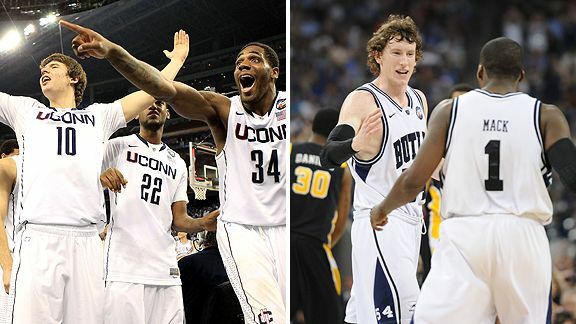 The field of the 2011 NCAA Tournament has been whittled down all they way from 68 teams to just two as the Huskies from Connecticut and the Bulldogs from Butler have fought off all coming and will play for the national championship on Monday evening. But who will be crowned king of the dance? It's time for my national championship game prediction. Interesting that you would consider an Horizon League team the experienced team in a national championship game over a Big East team but that is what we have here. The majority of this Bulldogs team played in the national title game a year ago in which they just barely lost to the Duke Blue Devils. Butler has been coming together to be the team that most of the country had high expectations of before the season. They have been cradling the glass, especially on the offensive end, as Matt Howard and friends have given their teammates more opportunities on the offensive end. And Shelvin Mack has been downright terrific this tournament and has had great effectiveness shooting the ball from outside. But Jim Calhoun does not lose national title games, having gone 2-0 as UConn coach. And his team has really come together over the last month behind the spectacular play from Kemba Walker, who has done it all and more for this young Connecticut team. Jeremy Lamb has been doing his best Ray Allen impersonation and Alex Oriakhi has given the Huskies a solid presence in the paint. Interesting that this team which Sports Illustrated did not even have making the tournament before the season is in this position. I think it will be a terrific championship game on Monday on CBS but I do think it will be the Huskies cutting down the nets.